Apple has finally released the iPhone X. Now that some people have them in their hands we have some images and an official iFixit teardown. The iPhone X got a 6 out of 10 repairability score, which is okay for professionals, but not great for home repairs. The screen comes off the phone similarly to the iPhone 8. The first thing we noticed was the dual cell battery. In order to make the battery bigger, Apple split it into 2 batteries, connected with a circuit board. The battery is removed the same as it has been for the past few years, with pull-tabs. What surprised us the most, were the size of the cameras. Both the front camera / facial recognition camera, as well as the dual lens camera on the back are huge compared to older models. Other than the screen and battery, the cameras seem to be the only things that are getting bigger. Here’s the bad news, so far. The back glass on the iPhone X seems to be relatively permanent at this point. The glass is mounted on the back with the camera shroud on top of it. It seems, we are going to have a hard time mounting a new piece of glass without removing that camera shroud, which appears to be welded to the frame. Eventually, back glass iPhone X replacements will be figured out, but for now, don’t break the back glass or the front for that matter. Samsung OLED screens (which this iPhone X uses) are the most expensive screens a cell phone can use. 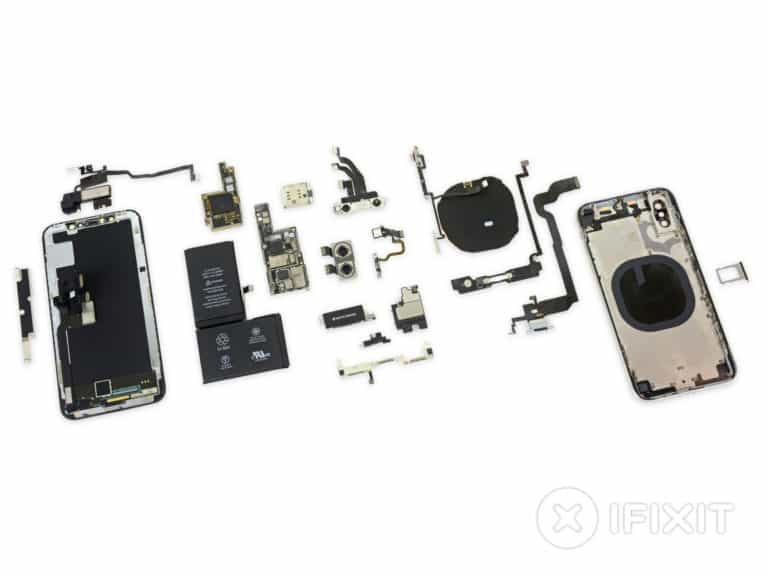 Thanks to iFixit for all the great photos and the teardown. See the entire iPhone X teardown below.